Dove Thermal have considerable experience in the application, design and manufacture of electrically-fired HTF heaters and heating systems. Electric firing offers very precise heat input and control, and location of heat source adjacent to application on the factory floor. Coil-type boilers fired by gas or fuel oil are best located away from production spaces, as may be required by statutory regulations and/or insurance considerations. There are instances where steam heating of heat transfer fluids offer a convenient and economical solution to local application requirements. As they do not require ventilation for combustion air supply, electrically-fired and steam-heated calorifiers are suitable for installation in airconditioned spaces and clean room environments. HTF heating and hot oil systems can be worked either side of atmospheric pressure, although pressurised installations allowing operation above their normal saturation temperatures are more complex than for steam - partly through need to inhibit oxidation of the working medium. Even so, a synthetic HTF or thermal oil heater can run at 300 deg.C under normal pressure, whilst saturation pressure for dry steam at that temperature is around 85 barg. No thermodynamic pressure is induced where the fluid vapour pressure remains below atmospheric, and engineering costs are much-reduced if systems are to operate only under gravity head. When thermal fluids are operated above saturation pressure, oxidation may be inhibited either by cooling the system expansion tank or nitrogen-blanketing the liquid surface. Generally speaking, electric calorifiers operating below 0.5 bar(g) fall within SEP classification of the PED and are not CE marked. 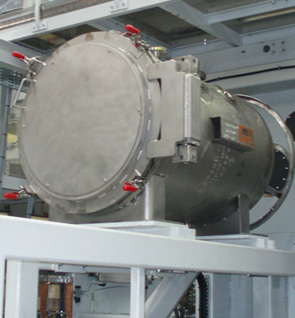 Dove Thermal Engineering has built fired- and unfired HTF heaters for Therminol and Dowtherm synthetic fluids and Shell Thermia hot oil systems. We have successfully worked Solutia T66 at temperatures to 340 deg.C under atmospheric pressure - as for our Klieverik thermo-bonding calendering machine installation (see our Gallery page). 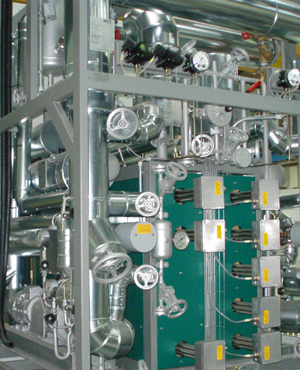 Our shell-and-tube pattern electric calorifiers have been configured both as skid-mounted and installed systems. 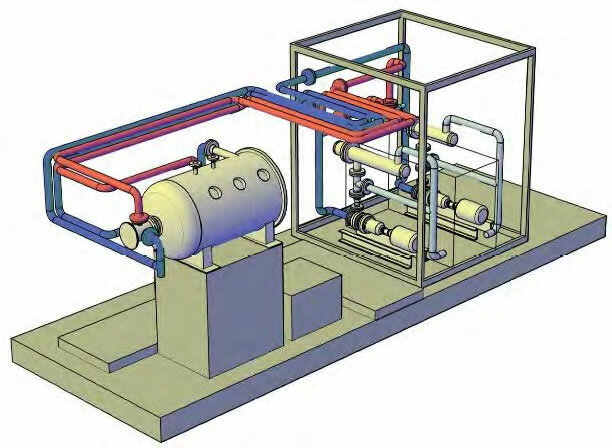 The isometric shows a modularized pair of electric HTF heaters packaged as drop-in replacements for an earlier gas-fired plant. 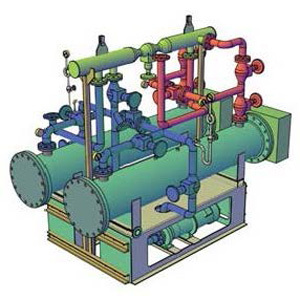 Although carbon steel is to be preferred for hot oil heating and thermal fluid plant operations, we have designed, stressed, built and commissioned pressurised systems in other materials by request. Thermally-induced movement in carbon steel is lower, and properties retention much superior. Our method for pre-tensioning pipe support systems enables quick and accurate installation.